Recently, the Institute published its first book based on an international partnership with the Commonwealth Secretariat. 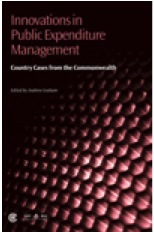 Innovations in Public Expenditure Management: Country Cases from the Commonwealth speaks to the emergence of public sector financial management as a source of experimentation, change and challenge. As governments try to reconcile increasing demands with constrained resources, they look to new ways of thinking. This compendium of cases documents a number of such efforts. 3. Democratization of the budgetary and allocative processes that involve greater citizen participation, reduction in highly centralized political and bureaucratic control. The cases cover a range of these issues. However, some key themes did emerge as the cases developed. It would be foolhardy to suggest a few key innovations in public expenditure management that would resolve all the various tensions and challenges outlined above. These cases demonstrate that many efforts are in place to make things better. Further, they show momentum and drive. While this is often localized there is much to be learned from them. o Capacity is Growing: More technical competency and tools to get the job done are emerging and becoming more accessible at lower costs. o Strategic Role of the CFO: The competencies of financial management professionals will continue to evolve with a greater and greater emphasis on integrative and analytical skills. Nowhere more is this emphasized than in the professionalization and change in the role of the public sector Chief Financial Officer. (CFO). o Integrated Approaches to Risk: Tools that link organizational performance and financial performance will continue to draw upon new dimensions such as integrated risk management and strategic planning. o Greater Public Understanding: As performance measurement and financial and performance information grows in accessibility and quality, the capacity of citizens, NGOs, other government and the media to understand and challenge budgetary and financial performance information will grow..
o New Ways to Measure: Accompanying this growth will be the demands to relate financial information to broader issues, such as gender equality and sustainability. o Integrity Requires Innovative Responses: Questions of integrity of public expenditure practice, honesty in government and public trust will continue to demand innovative responses: nothing is settled in this very fluid area. Building public trust in the allocation and management of public expenditures is not simply a matter of more information. The public also needs to have confidence in those providing the information. o Better Oversight Not More: New ways are emerging to improve the oversight of government financial practice, such as the introduction of social audits in various countries as well as independent oversight by interest groups posting analysis for public use. o Becoming More Local: Community-based resource allocation is now possible, not just through the cases we have outlined, but also because better information is available and modern social networking tools facilitate a level of social integration around such issues. Each case in this collection provides a story, a context and lessons learned. There is much to learn. Perhaps the greatest learning is that innovation in public expenditure management is no longer a matter of developed countries providing neat models of effective management to be adapted in the developing world. Innovation is taking root in both the developed and developing world and much can be learned. This is a two way street.